The bottom-line truth is that the decision of the US Supreme Court to uphold official Washington’s pig-headed disconnect between Jerusalem and Israel doesn’t mean diddly-squat. It signifies zilch, zippo, nada, gurnisht, bubkes. This is quite apart from of the fact that the court technically only dealt with American constitutional hairsplitting on who’s empowered to recognize what abroad. Such pedantry may perturb American jurists but for us Israelis it absolutely doesn’t change a thing. We simply shouldn’t care if they say we aren’t who we know we are. What any American higher-up in whatever bureaucracy in whichever branch of government finds it expedient to opine cannot factually alter our identity. It’s as straightforward as that and is in essence what 12-year-old Menachem Zivotofsky understood. His battle against federal obduracy reached all the way to the highest US court but Menachem lost his appeal to have his American passport register his birth as having occurred in Israel rather than in an undefined Jerusalem. What he said goes for us all. It doesn’t matter if by some screwy foreign diktats Menachem’s birthplace, the Shaare Zedek Medical Center (situated in West Jerusalem, well inside the unaccountably sanctified Green Line) is declared to be in Outer Mongolia. The hospital (whose name ironically translates into Gates of Justice) is still in Israel and always was. It isn’t even in remotely disputed territory, wasn’t wrested from anyone and never belonged to another state or entity. Nothing anyone overseas says to the contrary will affect reality as it is here. Finicky interpretive nitpicking in Washington doesn’t impact facts on the ground in faraway Jerusalem. The White House and its Department of State keep on pretending – against the elementary laws of physics – that time stood still in November 1947. It’s no jest: by Washington’s arcane logic, all clocks came to a halt 68.5 years ago and there has been no movement since. All tribulations and transformations in the ensuing decades are figments of our willful Israeli imagination. Ongoing Israeli waywardness rankles the DoS‘s diplomatic wizards and earns Israel no brownie points in Obama’s halls of omniscient power. It is utterly misleading to imply, as some of Israel’s left-leaning commentators did with undisguised relish, that the key date here is 1967 and that the Supreme Court’s ruling was inspired by Administration annoyance with Prime Minister Binyamin Netanyahu. According to our voluble talking heads, this is yet another comeuppance resulting from Netanyahu’s perceived intransigence about territories Israel won in 1967. Hence the jubilation with which the news of Menachem’s defeat were imparted to the fretful nation. So what if the American court never considered the actual conflict and only gave Obama carte blanche to make whatever call he deems fit? Since when did a few key facts interfere with brazen mega-distortions? But the Ramallah spin is telling just the same. As soon as Mahmoud Abbas and his cronies classified West Jerusalem – inside the Green Line where Shaare Zedek resides – as occupied territory, they gave the lie big-time to their two-state malarkey. If there was a scintilla of sincerity in their contentions that all they want is a return to the June 4, 1967 lines, they wouldn’t characterize West Jerusalem as occupied. If they genuinely only hankered after a re-division of the city, they wouldn’t lay claim to the other side. If they earnestly only desire compromise, they wouldn’t begrudge Israel sections of Jerusalem that were always indisputably Jewish. Had a trace of honesty invaded Arab rhetoric, Abbas and his crew would admit that the relevant date is November 29, 1947 when all Arabs spitefully spurned the UN Partition Resolution. It’s high time Abbas admits that it was Arab military contravention of that resolution which split Jerusalem – a city that has had a solid Jewish majority since the first census was taken there in the early 19th century, well before the advent of modern political Zionism. 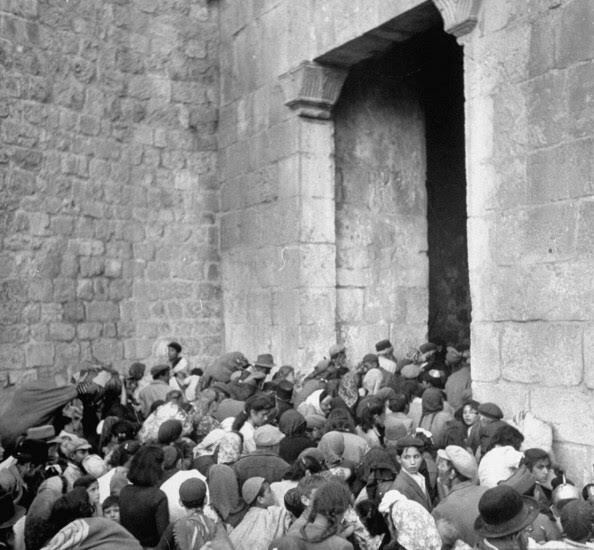 Thumbing their noses at the 1947 UN Resolution, the Arabs assailed day-old Israel, violently expelled the Jews of the eastern half of Jerusalem and attempted to take all of it by starving out the Western neighborhoods. But all that occurred after the timepieces of US diplomacy opportunely ceased ticking, which is why official America takes no cognizance of post-1947 upheavals. The first diplomatic showdown over Jerusalem took place in the UN’s arena a mere two years after the onset of the great American time-freeze. Israel’s legendary first premier, David Ben-Gurion, refused to kowtow to the bizarre decree that the hands of the clock be moved back to 1947 and that the UN Partition Resolution be imposed on Jerusalem after the Arabs had violated it. That resolution earmarked a status of corpus separatum (separate entity) for Jerusalem, to be overseen by international administrators. Since the Arabs had already belligerently scuttled the Partition Resolution, besieged Jerusalem, conquered and occupied its eastern parts, forced out all Jews from the Old City and demolished sacred Jewish sites, Ben-Gurion saw no logic in unilateral Israeli adherence to impotent UN proclamations. On December 5, 1949, five days before the UN General Assembly was to reiterate the internationalization of Jerusalem (and kick off preparations to take control), Ben-Gurion defiantly declared Jerusalem as Israel’s capital. Without trepidation he told the Knesset: “We consider it inconceivable that the UN would attempt to sever Jerusalem from the State of Israel or infringe upon Israel’s sovereignty in its eternal capital… Jewish Jerusalem will never accept alien rule after thousands of its youths liberated their historic homeland for the third time, redeeming Jerusalem from destruction and vandalism. “We do not judge the UN, which did nothing when member-nations of the UN declared war on its resolution of 29 November 1947, trying to prevent the establishment of Israel by force, to annihilate the Jewish population in the Holy Land and to destroy Jerusalem, the holiest city of the Jewish people. “Had we not been able to withstand the aggressors who rebelled against the UN, Jewish Jerusalem would have been wiped off the face of the earth, the Jewish population would have been eradicated and the State of Israel would not have arisen. Thus, we are no longer morally bound by the UN resolution of November 29, since the UN was unable to implement it. These words should reverberate in American ears even now – although the UN was impervious to them. On December 10, 1949, its General Assembly voted by a whopping majority (38–14, with 7 abstentions) to uphold its 1947 resolution and place Jerusalem under the auspices of a UN Trusteeship Council, to be governed by the Council’s own appointees. On that occasion the US opposed the resolution but only because it was considered unworkable. Nonetheless, the State Department’s overriding organizational spirit and predisposition didn’t dovetail with America’s pragmatic vote. The DoS balked at recognizing Israeli rights to any part of Jerusalem. That same contrariness prevails to this day. America’s de facto policy is to confine the hands of the clock to 1947. But that’s only vis-à-vis Israel which aroused ill-will in Washington even in its infancy – just after having repelled a concerted genocidal attack. It was as if the Jewish state’s survival disappointed DoS experts who avidly predicted its demise. All that while, Washington brought no pressure to bear on synthetic Transjordan (now synthetic Jordan) whose Arab Legion had illegally occupied half of Jerusalem. That illegality (which lasted 19 years) has since been pronounced an Arab birthright from time immemorial. He assertively stressed that “the State of Israel has had, and will always have, only one capital—eternal Jerusalem. This was so three thousand years ago and so it will be, we believe, to the end of time.” Ben-Gurion then put to the plenum’s vote his proposal to transfer the Knesset and the government from Tel Aviv to Jerusalem. It was approved. Washington, however, sternly disapproved and still disapproves. Although the General Assembly’s resolution was ignobly consigned to history’s rubbish bin, the US Embassy never budged from Tel Aviv. Israel was incalculably weaker when it dared to stand up against sinister designs to install foreign overlords in Jerusalem. There literally wasn’t enough food to feed the population. We clearly and painfully weren’t the world’s darlings even when we fought for our very lives merely three years post-Holocaust. During their entire long UN-flouting invasion of newborn Israel, the Arabs were actively aided and abetted by the Brits. The UN, which didn’t impede the Arab assault, found nothing better to do than send observers to keep tabs on “illegal” Israeli moves. The Americans chillingly slapped an arms embargo on the terrifyingly endangered Jewish state. Yet embattled little Israel didn’t cower. This is something for today’s successful and incomparably stronger Israel to remember. Current alarms are being raised by obsessive Osloites with political axes to grind, who anyhow serially advocate Israeli retreats under all circumstances and for any pretexts. If our knees don’t buckle, we won’t fall and won’t be swept away. If we survived the massive multinational onslaught on our bond to Jerusalem in our most vulnerable days, we can certainly survive the US Supreme Court’s sustenance for the stupidity of American statecraft. What I can’t fathom is why successive Israeli governments are stupid enough to give credence to the myth of the so-called “Palestinian people”. The US Supreme Court, by this decision, has brought everlasting shame upon itself and upon the individual Justices who supported this decision. But when considering this decision from the long view of American history it should come as no surprise to anyone. There is likely not a single educated Jew in the world who is not familiar with the story of the MS St. Louis, a German ocean liner most notable for a single voyage in 1939, in which her captain, Gustav Schröder, tried to find homes for 915 Jewish refugees from Germany. After being refused the right to disembark its 915 Jewish passengers in Cuba, the ship attempted to dock in Florida but the United States Government blocked that attempt believing that 915 Jewish refugees were 915 too many to absorb. The ship was ultimately forced to return to Europe where a great many of its passengers eventually were murdered in Auschwitz and Sobibor and various other death camps. America’s well known premeditated reluctance to try to save the Jews of Europe is well known and requires no elucidation from me. Not a single mile of the railway tracks leading into the Death camps was ever bombed. Indeed, the old and tired excuse given by the US that their bombers were not able to carry sufficient fuel to reach the Death camps was long ago proven to be a despicable and knowing lie. At Yad Vashem one may visit a room that houses huge photographic blowups of the military surveillance pictures the bombers made as they passed over the Death camps on their bombing runs to more distant places. The pictures are so clear that one can even see the long lines of Jewish prisoners being herded into the gas chambers as well as close ups of the crematoriums where they were burned. These photos, taken with ultra high tech camera lenses represent the living proof that the US knew precisely where the Death camps were located but did not feel inclined nor in the least bit motivated to intervene in the mass slaughter of Jews taking place during the Holocaust. Compared to these above facts, the recent Supreme Court Decision almost palls meaningless in comparison. Indeed it was to be expected. Finally, it should be noted, though many will find it uncomfortable to admit, if the State of Israel existed anywhere in the world outside the Middle East, the US would take little interest in nor lend so much military and financial support as it does to this relatively tiny Nation. In the world of Geo-Politics the State of Israel represents a key piece in the overall International structure and make up of the global American Defense establishment. The US needs Israel just as much as Israel benefits from its relationship with the US. In fact Israel is the one single country in the entire Middle East that the US knows it can always count upon when push comes to shove. In the final analysis, young 12-year-old Menachem Zivotofsky knows very well where he was born. He was born in the State of Israel, he will live out his life if he so chooses, in Israel, (may it be long and Fruitful) and if he chooses to be buried in Jerusalem, it will mean he chose to be buried in the State of Israel despite what any pencil pushing bureaucrat and/or Supreme Court Justice decrees. This is a very sad and dark day for the Supreme Court of the United States. It is not the first and judging by historical experience, it will likely not be the last. But the State of Israel will live on. The Jewish people will live on. It is all a measure of valuation. Millions of Syrian and Iraqi refugees were accepted in spite of the drain on the local economies. Just today, forty thousand North African Muslims were accepted into the European Union though the chance of their integration into the local economies and cultures are slight. The Lipizzaner stallions were saved by Patton in spite of considerable danger. All these are valuable. On the other hand, Jews are considered a malignant influence. Only the exceptionally famous or rich are secure. If we examine the train tracks to Auschwitz in that light, it all makes sense. For the Germans, the Jews had an extremely negative valuation. In spite of the need for shoes, clothes, ammunition and provisions at the Russian front, the trains to Auschwitz kept running. As such they also had a positive valuation for the Allies (the United States, Britain and Russia). For them, a carload of shoes not reaching the Eastern Front were worth much more than the lives of a carload of Jews. This is still the valuation of the Jews and when seen in that light, the politics suddenly become obvious. The Jews have a negative valuation. Those Nobel prizes and entrepreneurial talent only increase the coefficient, not change the sign. The valuation becomes even more negative. Those Jews become more malignant and so, more dangerous. So one worthless Gazan, even at zero, is far more valuable than any Jew. You don’t like it? The Navy Seals have training bell, you can ring it and punk out at any time. The Jews have one too – and many Jews use it. The ones who are left are the chosen. God doesn’t do the choosing; you do. I fully understand the point “J’Opinion” made above. However, we should never forget that in actuality, during the Holocaust, both the Nazi’s as well as all their willing executioners and partners reaped astronomical financial benefits as they destroyed their Six Million defenseless and helpless victims throughout Europe and as far away as Greece. It was not enough to seize all their bank accounts, their land and property, their household furniture, wedding rings and all other valuables, objects both large and small. Before burning them in the ovens their hair was removed to be sold as filler for pillows and the gold fillings in their teeth were pulled out and melted down into Gold Bars that added up into the tens of millions. Even the ashes from the crematoriums were saved and later sold as fertilizer. There was not a thing of even the least value which the Nazis missed. And though there is still some debate as to whether the Nazi’s made lampshades with the skin of dead Jews or made soap by skimming the fat and other liquid residuals from the huge burning pits, I have read and seen sufficient first hand evidence to be convinced of the veracity about the lampshade and soap stories. The comment by “J’Opinion” possesses merit but let us never forget that the slaughter of the Jews that took place during the Holocaust, did not arise only due to rank historical anti-Semitism and age old hatreds but was very much fueled by the wide European desire to seize everything of financial value that the Jews had worked for and accumulated over the centuries by the sweat of their brows. The battle to force the Swiss Banks to own up to all the assets they were hiding and hoarding that belonged to dead Jews was like pulling teeth, pun definitely intended here. While it is quite true that a great many of the Jews loaded into the cattle cars possessed little or nothing of any worth, when you murder and seize the lifetime assets of Six Million human beings, there is no question that you will amass a degree of wealth that defies description. Even in the waning days of WW II Europeans everywhere were still prying up old wooden floor boards in thousands of JudenFrei towns and villages, searching attics and digging up stone cellars, certain that the Nazi’s had not found everything there was to find that had once belonged to Jews. Of course the most valuable thing the Nazi’s took from the Jews was their lives including the lives of one and a half million innocent children and babies whose tiny heads were bashed against brick walls and the iron wheels of the cattle cars as their brains were splattering into their Mother’s disbelieving eyes and faces. Do I seem obsessed with hate and rage for what has been done to our people ? You will never imagine in your wildest nightmares, to what degree. The State of Israel is likely the only nation on Planet Earth which must field an armada of fighter jets with live pilots sitting in the cockpits at the controls, 24 hours per day and night, 365 days per year. And Nuclear bombs and missiles are always at the ready. Very few people know how close Israel came to making use of those weapons during the Yom Kippur war during it darkest hours. And Israel would have been totally justified in their use. Israel’s enemies were lucky that time. They will not be so lucky next time. I do not believe the State of Israel will be required to fight more than one additional war in our lifetime. Because the next time Israel is required to defend itself in an all out war against those wishing to harm Jews, the level of lethal destruction that will be visited on all of Israel’s enemies will be such that those enemies will need a hundred years just to begin to recover. I am thinking here of Iran in particular. G-d Bless the State of Israel from North to South and East to West. And G-d Bless all Jews everywhere who stand up speak up and Defend the State of Israel with every fiber of their Heart and Soul. Let’s hope Israel’s High Court doesn’t get any bright ideas and play copy-cat. Israel stood strong in the past and it prevailed. Israel will also prevail against it’s best “friend” America…a “friend” who ALWAYS backstabbed Israels achievements…like spoiling it’s Yom Kippur victory in 1973. Of course the US didn’t want Israel to come into existence in the first place…oh well. A lesson for us all and a reminder for all times. We must be reminded often and as needed with these facts and realizations. Excellent Sarah, just plain excellent. Thank you. And G-d Bless all Jews everywhere who stand up, speak out and Defend the State of Israel with every fiber of their Hearts and Souls. For a period of time, Jews went to trains, because they “trusted” Hitler’s instruction and reasoning for leaving German cities, traveling to camps – later executed. Why trust Hitler? In later phases, Jews were just threatened to leave, but not initially. I do NOT believe Jews are stupid, just wandering like sheep, without a fight, onto the trains to their death. I asked this while in Germany, after presenting in the Hannover Messe. I travelled and ate dinner with old NAZIs and Jews together. My U.S. father has battle stars for the three big German battles, so I grew up with respect for Jewish survival. The Jews understood from meetings that the German cities were going to be leveled flat by brand new aerospace Carpet Bombing, leveling their city homes, everyone’s homes. Germany! If I understood, railroad tracks and remote camps connected to the railroads, were taught to be safe from carpet bombing… Obviously that was a lie, but provides insight for the reasoning why Jews headed out of town on the trains without fighting to stay in the cities. Over time, cities were carpet bombed flat. I have an interest in govt manipulation, anywhere! It is true that in select areas, Jews were told they were simply being “resettled” and were transported in traditional passenger trains with seats, in which they could even choose whether to purchase a regular ticket or a First Class level Ticket at a higher price. Imagine- thus unwittingly paying an extra surcharge to be conveyed to their death. There exist photos of more affluent Jews disembarking from these First Class Train cars dressed in quite fashionable, expensive clothes possessing no idea they would soon be going up the chimneys often within days if not hours. The regular Jewish camp inmates who stood at the disembarkation landings were warned, at pain of death, not to intimate in any way to these newly arriving Jewish passengers that they were about to be taken to the gas chambers and murdered. One Holocaust Survivor who assisted these unsuspecting passengers with their luggage remembered that these passengers would often give him tips, and in the currencies of many different countries. The Survivor later remarked how Surrealistic were these scenes of newly arriving well dressed Jews, as they placed tips in his hands, because he knew what they did not- and he would have been killed instantly if he had attempted to warn them which would have obviously immediately resulted in a mass panic outside the trains. But the Nazi ruse of employing passenger trains and even the subterfuge of having the Jews select which Class of train ticket they wished to purchase in order to increase the sense of “normalcy” to the “journey”, were in fact the exception and not the norm. In fact 99% and then add .99999% of all Jews who went to their deaths in the Nazi Europe Death Camps were transported at gunpoint, in airless cattle cars and the infamous box cars which constituted for huge numbers of Jews, their final coffin in which hundreds of human beings were packed in like sardines sans air, water or food and often for a week or longer as the death trains made their long meandering trips across Europe. There is so much erroneous material circulated regarding the horrors of the Holocaust. The truth is that unless one was there or has a Family member who was there and survived, the average person cannot even begin to imagine what living through the nightmare of the Holocaust was like. Every Survivor I ever spoke to, including all my former business associates over the years, has told me the exact same thing. Only those who carry the numbers tattooed on their arm can know what it was really like. No words have ever been invented, regardless of any language, that can begin to describe what it was like to be a Jew in Europe between 1939 and 1945. All the books and autobiographies and films in the world can only give one an approximate idea of what it was like to be placed in one of Hitler’s Concentration Camps. The book FORGED IN FURY by Michael Elkins, who was the BBC’s correspondent in Jerusalem, is well worth obtaining if one wishes to learn from the lips of certain Survivors who dedicated their lives during the Holocaust and forever afterwards to hunting down the Nazi murderers. Of course within a very short time, one can count the years on one hand, there will be no more former Nazis to hunt down. Those Nazis who are still alive are all in their late nineties. But the important reason for owning and reading and then rereading the above books is that one understands why not one square inch of the State of Israel should ever be negotiated away and/or traded for any type of transient and/or illusory “Peace” plan. Just as China will never vacate one square inch of Tibet, a nation China brutally invaded and seized by crushing military force, it is unthinkable that any part of the State of Israel should ever be vacated for any reason. The great difference between China and Israel is that one never hears a word from a single nation on Earth, suggesting that the Chinese government had zero right and/or justification to invade Tibet and should and MUST return control of Tibet to its people. But one never ceases to hear that land which Israel was forced to take in defensive wars while fighting for its very existence, should be surrendered to the same people who attacked Israel in the first place so that those same people can attack Israel yet again and again and again. How many Jews both in Israel and throughout the world do NOT understand any of this ? The number is far too many. But we will survive these present tribulations as we have done for thousands of years and will continue to survive these same tribulations for thousands of years into the future. What alternative do we have ? Yes, we’ve survived for thousands of years, but not the same. The world of Isaac Bashevis Singer that you and I came from was destroyed. Completely. Of the remnant, the half in America is busy destroying itself. What people have more abortions than live births? What people have a majority marrying out – with not even 2% (Pew poll) asking for the spouse’s conversion? What people have so many of their own use their God given talents to slander their own people? Yeshaya Liebowitz was renowned for inventing the term Judeonazis, Max Blumenthal, JSIL, the Jewish State in the Levant. Both give verbal ammunition to their inarticulate foes. The other half are the three groups in Israel. The Eurolover attempting to buy sufferance. The rude, crude center, daring you to pass them in the street. And the third, the hats, the Ezroid theobots(if you’ll forgive the idiosyncratic exegesis). Yes, we will survive – diluted and an embarrassment. Your comments are important, correct and entirely relevant, sad to say. It is absolutely true, as you stated, that the world of Isaac Bashevis Singer as it was and that of our Grandparents and Great Grandparents, is now no more. How much our world was turned upside down by the Holocaust. And how much the world in general for hundreds of millions of people was turned upside down and affected by WW II. Still, we cannot change the past. And we must recognize that perhaps in some ways, both large and small, that the State of Israel exists today because it arose, like the Mythical Phoenix of Old, out of the ashes of all that was consumed. The criticisms you cited are real and no one can deny them. And yes they are valid criticisms and unfortunate and even tragic. That said, one could say much the same about all people, of all ethnic backgrounds and nations today. We are definitely living in a very different world today than that of the past. And that new world contains some quite hideous aspects and governmental as well as human proclivities. Nevertheless it was just announced in the news, that the total world population of Jewry is fast approaching the total pre-Holocaust numerical level on a world wide basis. So- some solace there although it will not bring back the Six Million. And yes we have among us a mountain of so-called Jews who are almost as bad as our very worst enemies. Blumenthal and Friedman at the NY Times are among the worst. They are beyond redemption. And there are tens of thousands of Jews just like them. But let us be quite honest. It was the Jewish owned NY Times, that from the very beginning and practically to the end of the Holocaust, made every effort to play it down, often burying the worst news of the victims deep inside the back pages. And from the beginning until almost the end of the Holocaust it was America’s most influential and powerful Establishment Jewish Leaders who tried to soft peddle the horrendous events unfolding in Europe as regards European Jewry. They said it was best for American Jews “not to rock the Boat”. So there were always Blumenthals and Friedmans, et al at the NY Times as far back as one wishes to go. If it is of any consolation to you and I too need consoling, let us appreciate and praise the fact that whenever and wherever in the world disaster strikes, whether arising from Nature or Human causes it is the Jews of modern day Israel who are first on the scene, with the most hi tech medical equipment to alleviate the suffering and care for those in pain. And finally, as for the future of our youngest generation of Jews, let us admit that there will always be some who do nothing and a large number of young people who care about the future of both Israel and the world in general. Visit these web sites and learn about the “Google X Prize TO LAND A PRIVATELY FUNDED ROBOT ON THE MOON”. It is the ultra brilliant Israeli Team of extremely young Jews, some mere Teenagers, who are leading in this race to the Moon. Go to the following sites and add your name to get monthly updates on the Israeli Team’s progress Reports. We have much reason to feel justifiable Pride in what many among Israel’s new young generation are accomplishing.